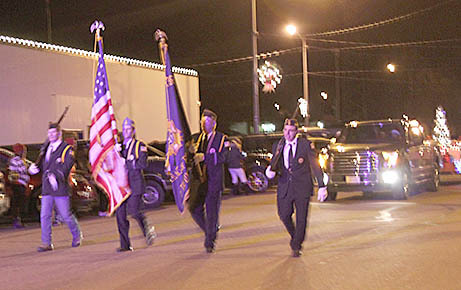 Veterans Color Guard leads the Albion Christmas Light Parade. Many area residents were on hand for Albion’s second annual Christmas Light Parade Thursday evening, Dec. 1, with temperatures in the high 20s. 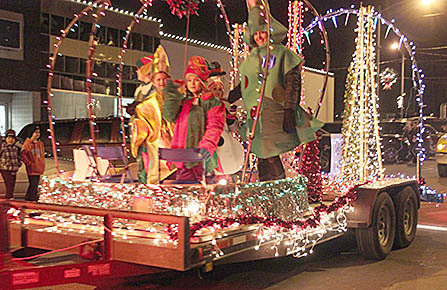 The parade again featured decorated floats that lit up the downtown sky, with entries from many area businesses and organizations. The chamber and Albion Veterans Club sponsored a chili feed at the Vets Club after the parade, and Santa Claus was on hand with treats for the children. • At Gateway Theatre for a hearing-impaired sound system as mandated by the Americans with Disabilities Act (ADA). 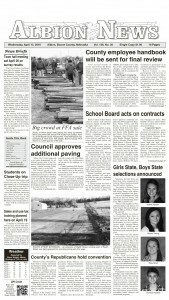 Chamber events continued Saturday, Dec. 3, with Super Shopping Saturday. At the downtown mini-park. Shopping bags with discount coupons and Chamber Bucks were handed out to the first 60 shoppers. A free children’s movie was also shown at 10 a.m. Saturday in the Gateway Theatre. Loco’s and Country Laminates lighted float.